Ansonia "Monarch" Shelf Clock c. 1890 Dimensions:24"tall by 15" wide at the base Maker/Mfgr./Author/Artist:Ansonia Clock Co., Ansonia, CT Condition:Excellent with restored door glass design. 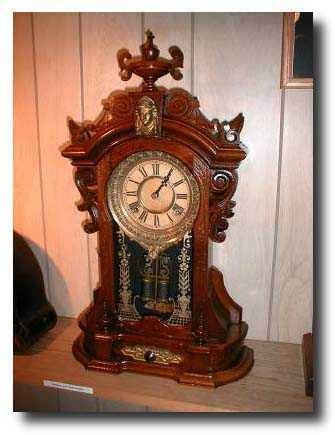 Circa:1890 Materials:Solid Oak case, brass movement; brass dial bezel with colored insets. Description:The Ansonia "Monarch" was so named because it was the top of the line among the Ansonia Clock Co.\'s Victorian mantle clocks. Expensive when it was first produced-even before the turn of the last century-it retains it\'s stature as one of the most sought-after of the Victorian clocks.Retains it\'s original dial and pendulum and all of the fancy hardware and fittings. The movement has been cleaned and it runs and strikes perfectly. The door glass gold design has been restored.